President Trump interrupted a meeting with two dozen CEOs from the largest manufacturing companies in the world to recount a story of his golfing glory. The mere mentioning of the incident wasn’t enough, however, and Trump called on Immelt to recount the story. “Should you tell that story?” Trump asked. Immelt obliged and told the bemused audience how he played golf with Trump as part of his “assignment” when he owned NBC, to persuade him to take part in the reality TV show, The Apprentice. "President Trump goes up to a par 3 on his course. He looks at the three of us and says, 'You realize, of course, I'm the richest golfer in the world?' ... then gets a hole in one." “I have to say I seen the magic before,” he added. The room broke out into a ripple of laughter before Trump chimed in: “It’s crazy. "No, I actually said I was the best golfer of all the rich people, to be exact, and then I got a hole in one. It was sort of cool." Trump, who was highly critical of Obama’s golfing trips, has reportedly spent the last three weekends perfecting his hole-in-one. 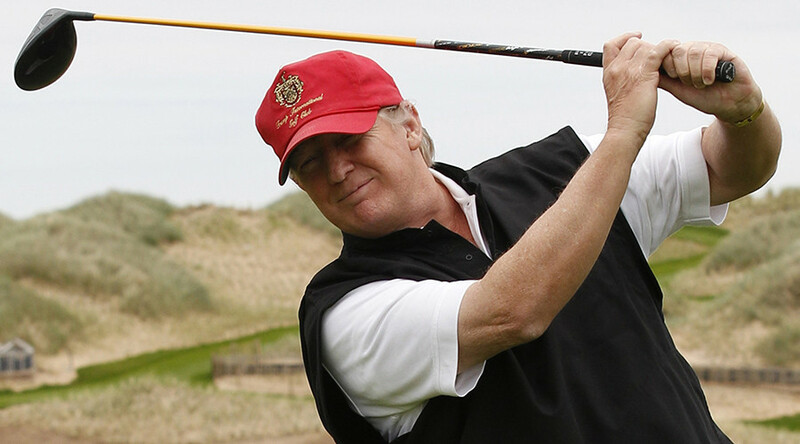 During his days as a private citizen, Trump regularly blasted then-President Obama for neglecting his official duties and squandering taxpayers’ money – all in the name of golf. "@TheBigJamesG: What kind of president doesn't get playing golf after a cruel beheading isn't the thing to do? Detached from reality he is"